Magento Marketplace Bundle Product allows the seller to add bundle product from front end. fully dynamic as per the admin . Mobikul Marketplace: Mobikul Marketplace converts your Magento marketplace store into a mobile app. Your customers can easily purchase products on the go. They don’t need to have a laptop or desktop, they can easily explore your store through their smart phones. It will not only benefit the store owner and customer it will benefit the seller’s too. Sellers can see their dashboard, order history and can contact to the admin through the mobile app. So what are you waiting for, you must now have a mobikul marketplace to be a step ahead. Note: The MOBIKUL Marketplace Mobile app is a different module. You have to install it separately. 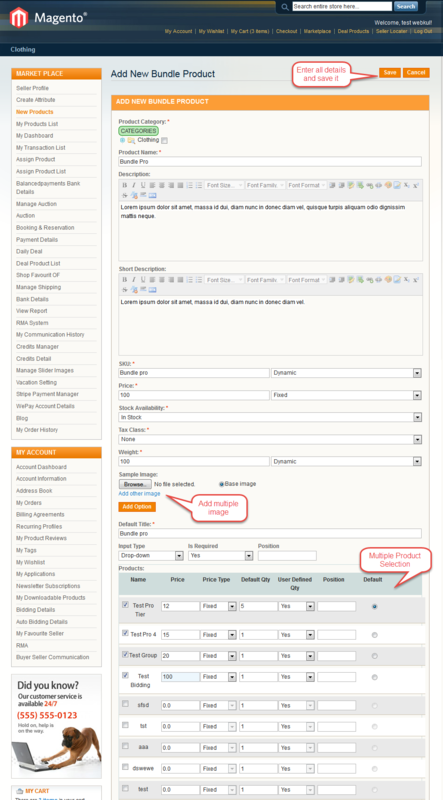 Magento MarketPlace Bundle Product module installation is very easy. You need to move app and skin folder into magento root directory that’s it as per the screenshot. After installing this module, the admin needs to go to back-end panel and follow System>Configuration>Marketplace>Seller Product Settings. Now, the admin needs to select the Bundle Product option in Product Type for Seller. After that, the sellers can easily add grouped product under Marketplace > New Products. After selecting the Bundle product from product type list, seller can enter details of Bundle product and add new Bundle Product.